Fall beckons. Leaves turn golden, then bright as a flight of fancy. Aisles fill with orange squash and winter greens at the farmers market. I've taken what I brought home from our market, put them together, and voila - a fall risotto makes it way onto the dining table. Enjoy the bounty of the season. Heat olive oil in a non stick skillet set over medium heat. Add the leek and celery and cook for about 2 minutes, until the leek begins to turn a bright green color. Add the rice and continue to cook for another minute or two. Reduce the heat to medium low, add the white wine, and stir to combine. Let the rice cook and absorb the wine. Heat the chicken or vegetable stock until very hot. I use the microwave and heat in 30 second increments until the stock is almost boiling. Add the stock, about 1/2 cup at a time, stirring after each addition, letting the rice absorb the stock before adding more. While the rice cooks and absorbs the stock, pre-cook the squash in the microwave for about 2 minutes, it will still soften somewhat. Taste test the rice after the last addition of stock, it should be almost done. If it is still too hard, add an additional 1/2 cup of stock. Taste again, then add the butternut squash, kale, creamer, and parsley. Stir and cook until the creamer is absorbed. The squash should be tender, and the kale should be hot. Sprinkle with Parmesan, then taste for seasoning, and serve. 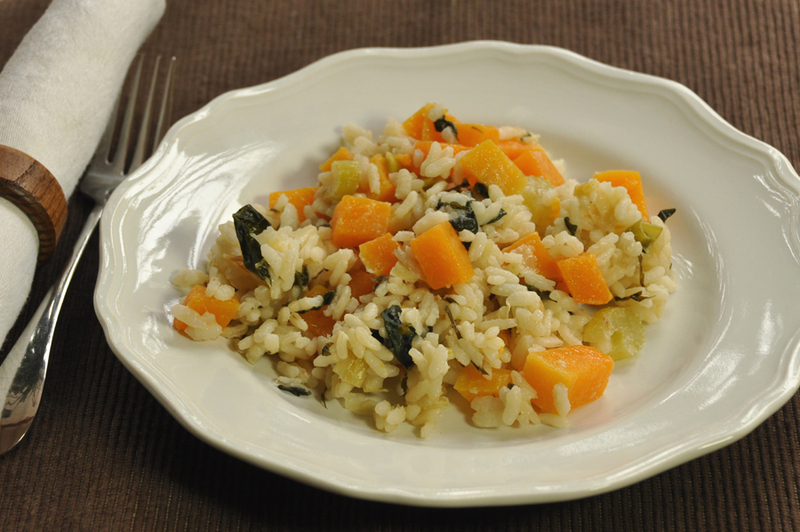 Stealthy Cooking Tip: Taste the risotto after sprinkling with Parmesan. Parmesan itself is somewhat salty, so your risotto may not need any additional sea salt. Also, the amount of salt will depend on the type of stock that is used. I made this rendition of risotto with homemade (sodium free) stock and no Parmesan, so found that I needed the full amount of salt!